Protesters of the 'Gilets Jaunes' (Yellow Vests) movement await French President Emmanuel Macron's arrival, during his meeting with the mayors of the Saone-et-Loire department, in Autun, France Feb. 7, 2019. Nathalie Loiseau, French Minister attached to the Foreign Affairs Minister, attends a government session at the National Assembly in Paris, June 13, 2018. 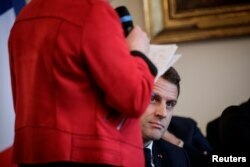 French President Emmanuel Macron attends a meeting with the cities mayors of the Saone-et-Loire department, as part of the 'Great National Debate' designed to find ways to calm social unrest of the Yellow Vests movement, in Autun, Feb. 7, 2019. Italian Deputy PM Luigi Di Maio speaks at the 5-Star Movement party's open-air rally at Circo Massimo in Rome, Italy, Oct. 21, 2018.